There's no doubt video has become an essential part of our everyday lives. It is a versatile medium that entertains, informs, educates and engages all types of audiences. And it is the most succinct form of media that allows the delivery of information in a neat audiovisual package, which makes it the perfect medium for the attention spans of today. The versatility of video means its creators and publishers are equally as diverse. 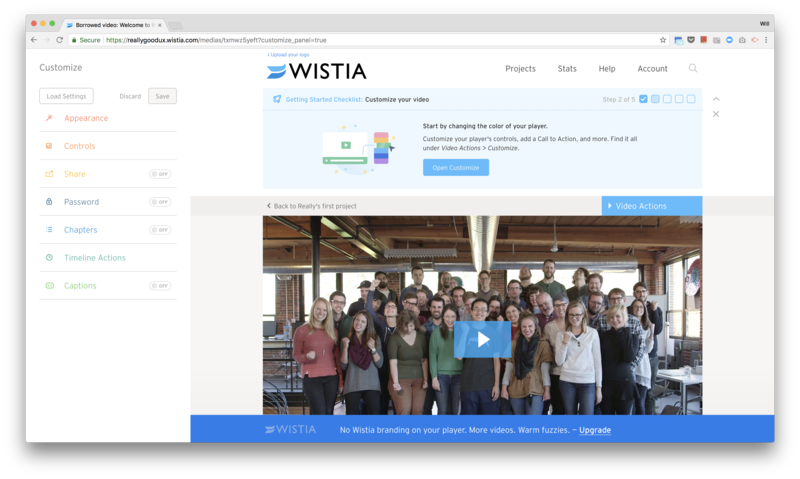 For Wistia—a tool for creating, managing and sharing videos for business—this means they need an onboarding flow to cater to all abilities and, more importantly, a flow that demonstrates their value whilst they have the full attention of their users. 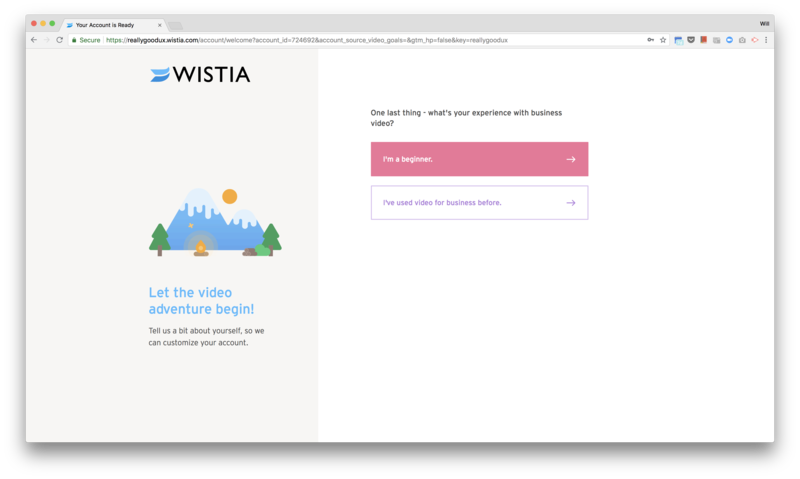 The onboarding flow is immediately put into the user's context with the question requesting the user's goal. This ensures the rest of the flow is relevant to the user's need for maximum impact. 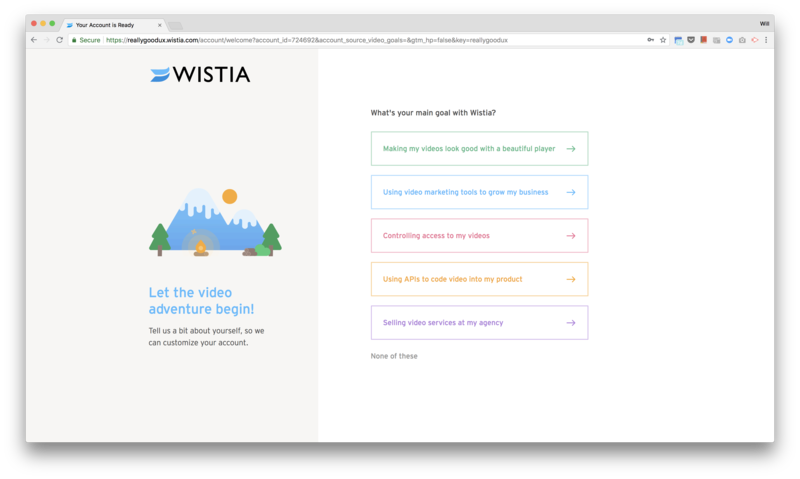 Additionally, the goals listed are tied to benefits rather than features to plant the value of Wistia in the mind of the user from the beginning. The level of user motivation and ability determines whether or not a user will take action. 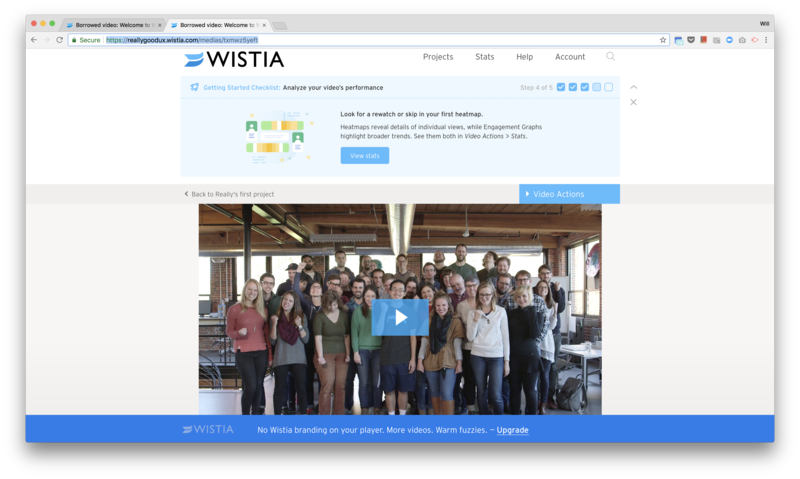 To solve the problem of users not having the motivation to upload their own video or not having the ability—or access—to upload a video, Wistia offers their own video to use. 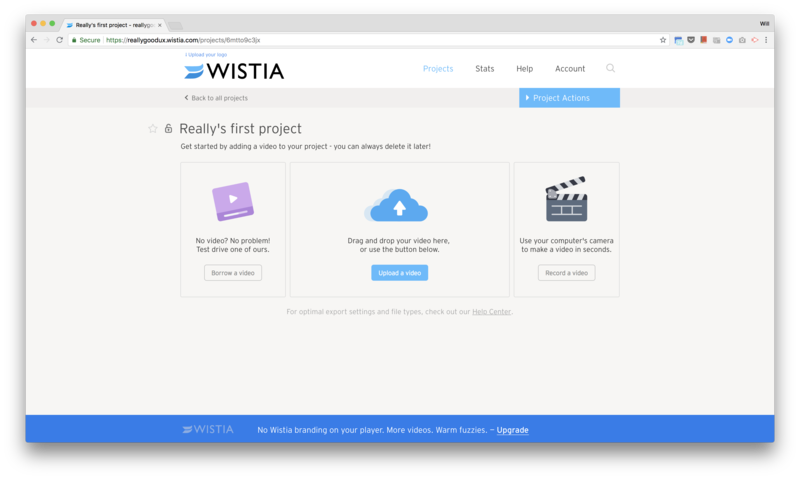 This brings down the difficulty of the task to ensure the actions Wistia asks their users to take are appropriate for the user's level of motivation. 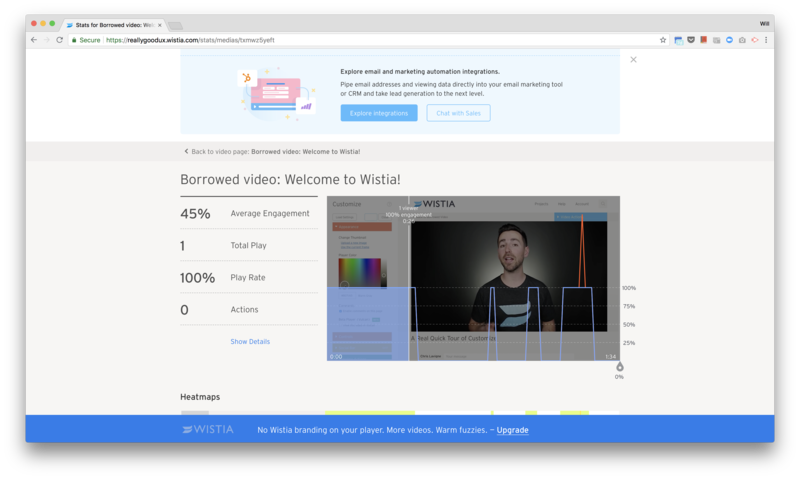 The video Wistia provides their user is not a random bit of footage: it's a key element in the onboarding flow. The video educates and informs the user on how to use Wisita in an engaging and concise way. 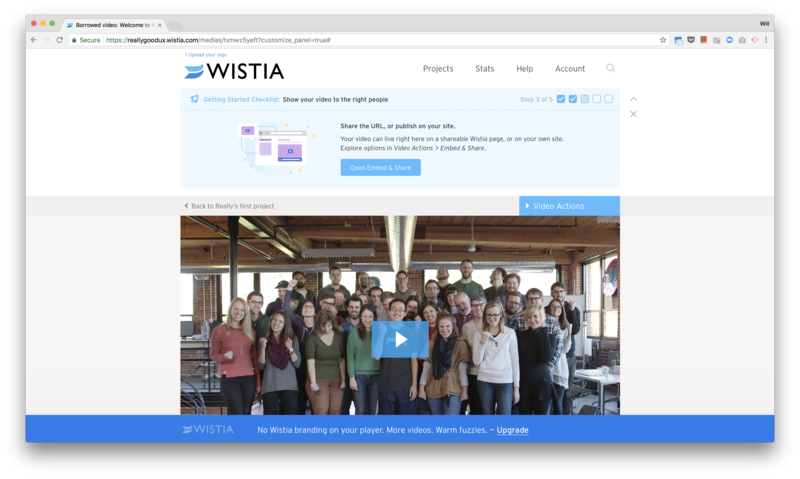 Instead of a passive onboarding flow—where a user is asked to click through features or slides—Wistia shows the value of their tool firsthand by getting their users to use the tool for themselves. This provides a compelling experience that clearly demonstrates the value of the tool. The checklist of the steps makes the task's minimum requirements explicit; it offers satisfying verification and prompts users to take further action. The checklist is a powerful tool that encourages users to complete the onboarding flow.